The Best Acoustic Electric Guitars in 2019: reviewed and rated! If you are planning on performing live, it would be a good idea to be prepared and have the best acoustic electric guitar. Being able to perform in amplified settings is a notable milestone in your career, and we’re here to help you pick out the right instrument that can take you from the studio to the stage. We’ve carefully hand-picked six superb acoustic guitars that come equipped with top-notch electronics. These acoustic-electric models are made by some of the world’s most trusted guitar brands, including Fender, Godin and Yamaha. Check them out and see which one calls to you. Martin Road Series DRS1 Acoustic-Electric Guitar Martin seems to be trying to keep up with Taylor by also offering acoustic guitars under $1000. Case in point: the Martin DRS1 guitar, part of Martin’s Road Series and designed specifically for the traveling musician on a modest budget. With a solid sapele body, the DRS1 is both durable and rich-sounding, something hardworking guitar players will surely love. Yamaha AC3R Acoustic-Electric Guitar Part of Yamaha’s A Series of road- and stage-ready acoustic guitars, the AC3R features an all-solid wood construction and SRT2 electronics with a 3-band EQ. The Studio Response Technology system offers players a wide variety of tone-shaping options and there’s also a feedback reduction feature, making the Yamaha AC3R a fantastic acoustic for your gigs. There’s an onboard tuner too! 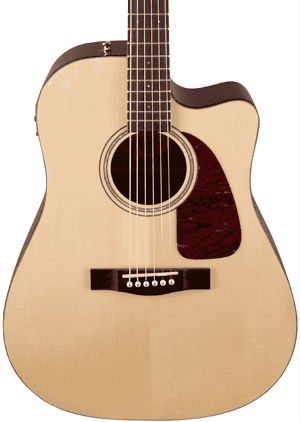 Fender CD140SCE Acoustic-Electric Guitar The Fishman electronics-equipped Fender CD-140SCE is one of the best acoustic-electric guitars you can get for a really cool price. Hint: If you have a guitar budget of $500, you’ll be able to buy the guitar - hardshell case included - and have plenty of cash left over for accessories like a mini portable amp. That’s great value for a Fender! Fender Tim Armstrong Hellcat Acoustic-Electric Guitar The Hellcat is a signature acoustic-electric guitar model based on punk rock icon Tim Armstrong’s favorite Fender concert-style acoustic from the ‘60s. The Fender Tim Armstrong Hellcat features hellcat fretboard inlays and two skull inlays marking the 12th fret. Equipped with a Fishman Isys III pickup/preamp system, the Hellcat is a great companion for musicians of all playing styles. Godin A6 Ultra Acoustic-Electric Guitar The Godin A6 Ultra offers players the acoustic sound with the playing feel of an electric guitar neck. This model features a chambered body, eliminating feedback completely. This ultra-versatile guitar is equipped with a Godin humbucker pickup in the neck position as well as an undersaddle transducer. Acoustic and electric outputs can be blended seamlessly with the custom preamp. The Martin Road Series DRS1 is a guitar you’ll be proud to own – and play wherever life takes you. 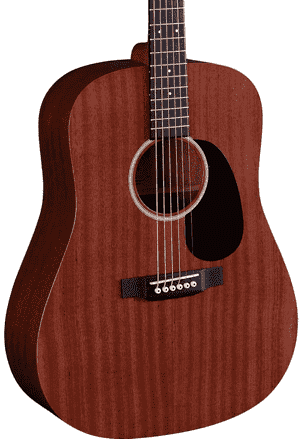 This acoustic-electric dreadnought is ready for the road with its durable solid wood construction. And thanks to its modified low oval neck profile, you’ll find the DRS1 extremely comfortable to play, whether you’re standing or sitting on stage, in a recording studio or a town square. The top, back and sides of the DRS1 are made of solid sapele and have a satin finish, while the top braces are made of solid Sitka spruce. The guitar is made more durable and affordable by the use of sturdy yet sustainable materials such as Stratabond for the neck and Richlite for the fingerboard and bridge. The overall build of the Martin DRS1 guarantees many productive hours through many miles. Even with the use of alternative materials, the DRS1 has that rich tonal quality that Martin guitars are known for. The warm acoustic sound can be amplified through the built-in Fishman Sonitone pickup-preamp system, which includes controls for tone and volume. Other features include a black pickguard, a tapered headstock, ABS white dot fretboard inlays, chrome enclosed tuning machines and a single ring rosette. The Yamaha AC3R acoustic-electric guitar was designed for performance and built for life on the road. It’s equipped with the new SRT2 pickup system for a dynamic and natural acoustic sound when plugged in. This concert-style guitar also has a cutaway so you can easily access the upper frets. The Yamaha AC3R is part of the company’s A-Series of performance-level guitars. Like all A-Series guitars, the AC3R has a straight taper neck with hand-rolled fingerboard edges, making the guitar more comfortable to play. The solid Spruce top of this acoustic-electric guitar also boasts a new scalloped bracing for a richer and louder acoustic sound. It has also been treated with the Yamaha-exclusive Acoustic Resonance Enhancement process, which effectively “aged” the wood, making the guitar sound like it’s been broken in and giving it a warm and rich mature tone. The Yamaha AC3R guitar also features solid rosewood back and sides, a mahogany neck, die-cast chrome tuners and an ebony fingerboard with dot inlays. The onboard Studio Response Technology system features a number of functions, including a built-in tuner, 3-band EQ, a three-setting mic type switch and blend knob, an A.F.R. switch to reduce feedback and a resonance knob. The Fender CD140SCE belongs to the company’s Classic Design Series. This is a dreadnought guitar that has been upgraded with a number of new features, including a solid spruce top, an easy-to-play neck profile, rolled fingerboard edges and a Fishman Presys pickup/preamp system. The dreadnought body has a cutaway, allowing players to fret chords at the higher frets easily. The sides and back of the guitar are made of laminated rosewood, while the neck is made of mahogany. The spruce top has a scalloped X-bracing that allows the top to resonate more freely, resulting in greater projection and a well-balanced tone. As for the Fishman electronics installed in the Fender CD140SCE, it has easy-to-use controls for volume, mid, bass and treble as well as a phase button. Tuning the guitar can also be done quickly with the help of the onboard tuner. The Fishman Presys system delivers a clear plugged-in sound and a naturally full-bodied tone. Even without plugging it in, the CD140SCE has a rich and resonant acoustic tone. It’s a versatile instrument that lets you play various musical genres, and because the top is made of solid wood, it’s bound to sound better the more you play. Another top-notch acoustic-electric guitar, the Fender Tim Armstrong Hellcat is a signature model based on the Rancid founder’s own Fender acoustic. Armstrong uses his ‘60s Fender concert-style guitar when writing songs, making this guitar a fitting tribute. 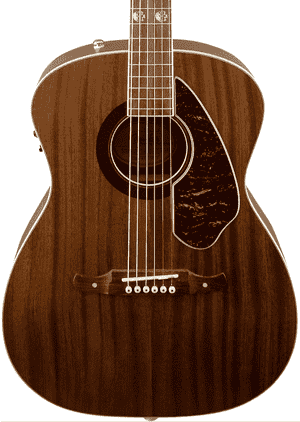 The Fender Tim Armstrong Hellcat acoustic guitar has a solid mahogany top as well as laminated mahogany for the back and sides. The body is given a satin polyurethane finish and cream binding. Like the Fender CD140SCE, the Hellcat also has scalloped X-bracing so that even unplugged, it delivers a good resonance and projection. The Hellcat also has a “C” shape maple neck with a smooth satin finish. The soundhole sports a ‘70s F-style mosaic applique rosette. The rosewood fretboard features pearl acrylic “Hellcat” inlays on the third, fifth, seventh and ninth frets, while double skull inlays mark the 12th fret. Tim Armstrong’s signature is prominently displayed on the truss rod cover. The truss rod is dual-action by the way. The Fender Tim Armstrong Hellcat is fitted with a Fishman Isys III system with an active onboard preamp that features volume and three-band EQ controls (treble, mids and bass). There’s also an onboard digital tuner for when you’ll need to do a quick check or adjustment. It’s hard not to have GAS – Gear Acquisition Syndrome – when you see what the Godin A6 Ultra has to offer. You can say that the A6 Ultra is aimed at electric guitar players primarily because it has the feel and look of an electric guitar with its slim, straight neck, solid cedar top without a soundhole and a front magnetic pickup in the neck position. It’s very thin too – the body is chambered, eliminating feedback issues. The two-chambered body is made from silver leaf maple while the neck is made of mahogany. It’s topped with a radiused Richlite fingerboard for a smooth playing feel. 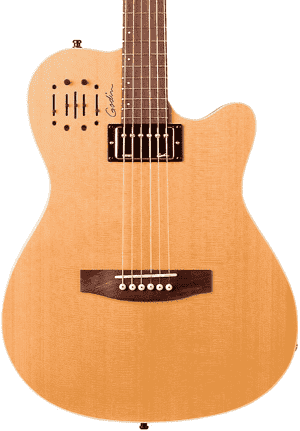 The Godin A6 Ultra is a dual-voiced, dual-output guitar, having the ability to produce sounds from the custom Godin undersaddle transducer as well as the magnetic pickup. The preamp features slide controls for the undersaddle pickup’s volume and the EQ (treble, mid, bass) for it. The last slider lets you blend in the sound from the Godin humbucker. There are knobs that let you control the treble and the bass for the magnetic pickup. The pickups and preamp controls give players access to a myriad of acoustic sounds, letting you shape your tone as you wish. Why buy an acoustic-electric guitar? Performing for an audience is often the next logical step for many guitar players, whether it’s with a band or as a solo artist. Making sure an acoustic guitar can be heard clearly is a task that’s made easier with the use of built-in electronics for amplification. So if you foresee yourself going down that route, you may want to consider investing in an acoustic-electric guitar. All of the electro-acoustic guitar models in this list are equipped with a pickup as well as a built-in preamplifier. Because these guitars already have electronics on board, you can plug them into an amplifier or sound system in a jiffy. The acoustic guitar can then be heard clearly without any distortions to the acoustic sound. Most acoustic-electric guitars even come with a built-in tuner, allowing you to tune your guitar easily even if you’re in a hurry so you can begin your set. The models we’ve selected are first and foremost acoustic guitars that play beautifully and already sound exceptional even without the electronics. With the electronics, you have the power to not only amplify your sound but also control the tone and shape it as you will. Another great thing about using an acoustic-electric guitar is that is doesn’t limit your mobility as you play. If you’ve ever tried using a mic to make yourself heard, you know what we mean. Just moving a few inches from that mic results in a loss of volume so you would have to stay as close to it as possible. Moving from side to side is a no-no. And if you want to sing and play at the same time, it would mean needing two microphones and you standing still so you don’t bump into the guitar mic or knock it over. With an acoustic-electric guitar in your hands, you can definitely move your body to the music freely and you’ll only need one mic. You can sway, walk around a little and just come back to the mic for your vocals. If you’re a beginner and have the budget for it, you can certainly get an acoustic-electric guitar right from the start. It will save you from having to buy an electro-acoustic model down the line, plus it will also allow you to experiment with the different tone controls and learn about various effects, making practice time more fun. We believe that the best acoustic-electric guitars are those that can hold their own while in purely acoustic mode, because if they don’t sound good from the get-go, you will have a hard time tweaking the tone using the electronics to come up with a sound that can pass as decent. 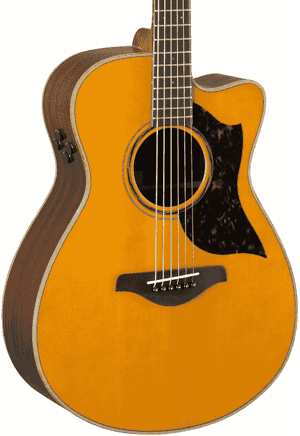 We also believe that you shouldn’t just buy the first electro-acoustic model you come across. It will only be a worthy investment if you choose the best acoustic-electric guitar for your particular needs and preferences. Consider what you are looking for in a guitar and how much you are willing to spend on it. Here’s a common method you can use to help you choose the best acoustic-electric guitar. Make a list of your top 10 must-haves in a guitar according to priority. If it’s a maple top you’re primarily after, put that on first. Perhaps it’s a total budget of $700 with accessories, or a cutaway. Any guitars that don’t have the first three characteristics you’ve written down can then be ignored or put on a list for further consideration. Perhaps you can do away with a cutaway if the guitar ticks the rest of your boxes. We hope the models we’ve listed above help you in narrowing down your options and make it easier for you to choose the best acoustic-electric guitar that will make you want to play more and help you boost your music career. We hope to see you on the stage soon! Know Your Instrument helps you learn more about your chosen instrument. We’re focusing on ukes and guitars for now but check back regularly as we will be expanding our repertoire! We are a participant in the Amazon Services LLC Associates Program, an affiliate advertising program designed to provide a means for us to earn fees by linking to Amazon.com and affiliated sites. | Know Your Instrument. All Rights Reserved 2019.